Since 2003, Healy Consultants Group PLC efficiently and effectively assists our Clients with i) Albania business registration ii) business licensing (when required) iii) Albania corporate banking solutions iv) visa options and staff recruitment strategies and v) work space rental solutions in Albania. Healy Consultants can secure Albanian company registration without our Client having to travel to the country to submit the documents. Subsidiaries registered in Albania will often benefit from waived/reduced withholding tax when remitting dividends and interest to their foreign parent company, as the country has a significant network of double taxation avoidance treaties with 37 countries including several EU countries, Russia, China and Singapore. There are no foreign exchange controls in Albania. As a result, our Clients are able to easily remit their profits to their home countries. Albania has poor-quality infrastructural facilities and has been ranked 94th (out of 137 countries) for its Infrastructure on the 2017-2018 Global Competitiveness Index. As a result, the nation’s poor-quality roads, ports, railways, energy infrastructure poses operational problems for Albanian based businesses. 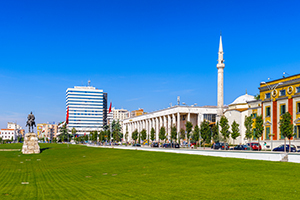 Albania is a great gateway for foreign Islamic business in Europe, as almost 60% of the population practices this religion. To help us engineer the optimum Albania corporate structure, please complete the 3-minute questionnaire below; then press the submit button below.